Doesn't that look fabulous? I can confirm that not only was it totally delicious, it wasn't difficult to make. The recipe comes from a new book 'Make it Easy' by Jane Lovett published by New Holland Publishers. 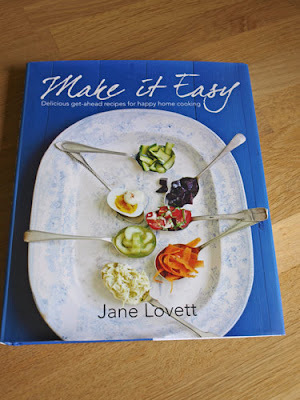 Jane describes Make it Easy as "A book for the home cook with the emphasis on get-ahead, easy, seasonal recipes with a contemporary twist" The book starts with useful top tips, notes on presentation, do's and don'ts and some general notes. Even if you don't do much entertaining, there are some great recipes to eat with the family, like the Quick Creamy Smoked Haddock Saffron and Chive Risotto and Spicy Sausage, Lamb and Bean Bake. 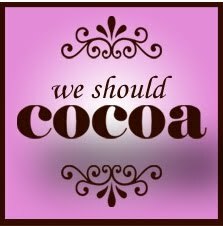 However, I was drawn to one particular dessert, not only because it contains some of my favourite flavours, but also because it fits perfectly with the July 'We should Cocoa' challenge which requires a combination of Blackcurrants and Chocolate. Preheat the oven to 140C (275F), gas 1 and line a flat baking sheet with foil or baking parchment. Whisk the eff whites with a pinch of salt until stiff, then add 225g of the sugar, a tablespoon at a time, whisking it in well between each addition. The mixture will be very thick and shiny. When all the sugar is incorporated add the cornflour, cocoa powder, vanilla essence and vinegar and whisk well again. Pile the mixture onto the lined baking sheet and mould it into a flattish round shape, roughly 20-25cm across and 4cm deep. Make a dip in the middle using a metal spoon. 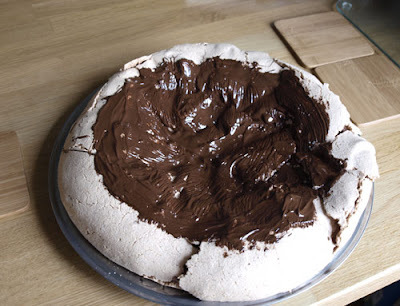 Cook for 45 minutes, then turn the oven off leaving the pavlova inside until cold, without opening the door. Carefully peel off the foil. Put the frozen berries into a non-reactive pan with the rest of the sugar. Warm gently over a low heat, just until the fruit has thawed, trying not to break it up. Tip into a sieve over a bowl and leave to drain for 15 minutes or so. Pour the juice back into the pan and boil fast, giving it the odd stir, until it has reduced to a syrupy consistency and just coats the back of the wooden spoon. Leave to cool. It will thicken up much more when cold. Whip the cream lightly into soft peaks and spoon into the centre of the pavlova. Mix the berries and the sauce together (this is when I added the fresh raspberries) and spoon over the top. The pavlova can be made several weeks in advance,wrapped tightly in clingfilm and kept somewhere cool and dry. The chocolate can be brushed over a few days in advance. 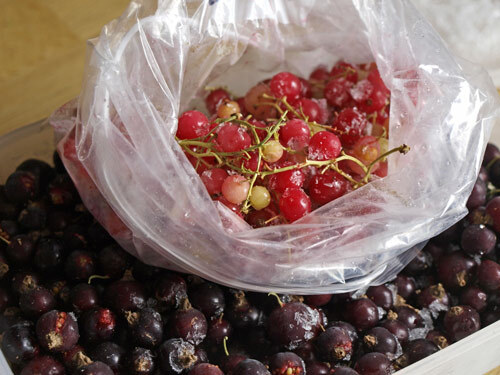 Make the fruit compote several days in advance and keep the fruit and sauce covered separately in the fridge, or freeze. Only mix together just before using. The cream can be whipped as early as you like on the day but should be under whipped as it will thicken up whist in the fridge. Leave out the cocoa if you prefer and the chocolate too. 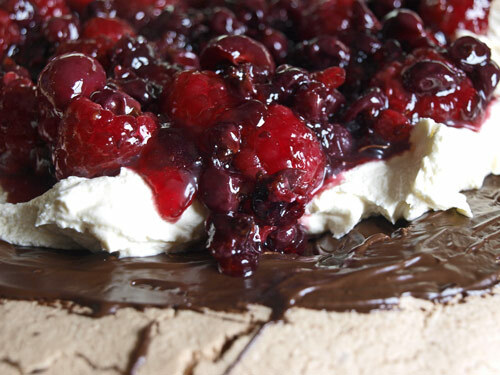 I've never brushed chocolate on my pavlovas before, but it is absolutely brilliant and really adds to the rich, earthy flavours of the berries without overpowering them. I would highly recommend this recipe and will be bookmarking more recipes in Make it Easy which is available through a popular on line bookshop for £14.99. This looks lovely - individual ones would be great to methinks and look very cute!! Fab looking and a little reminder that it's summer (supposedly). The book sounds like a keeper too - my wish list is growing longer by the day! This does look so tempting and the colours together are beautiful. 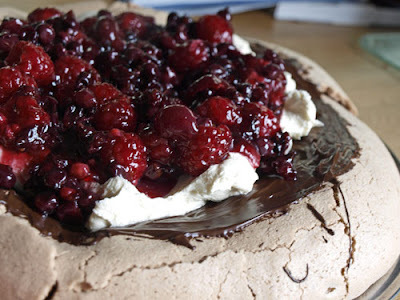 I love the fruits you have chosen to use and think chocolate pavlova is a fine idea! Jesus H Christ! What a stunner! 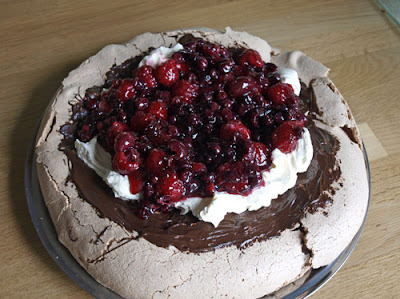 You had me at meringue... then chocolate... then berries.... Oy oy oy! This a thing of beauty to be sure! Delicious! 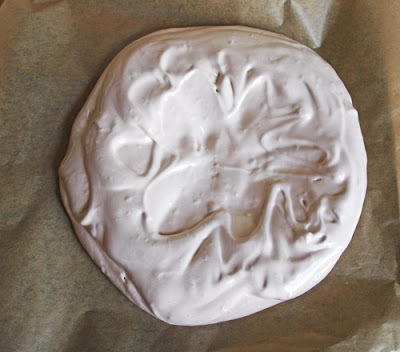 I so rarely make meringue, which is a shame as we all love them, especially pavlova. I think the whole combination sounds lovely! This looks amazing! Chocolate and berries are a great combination. What a marvellous entry to WSC Janice. Why haven't I ever thought of brushing chocolate onto meringues before! The berries look scrumptious as does the whole thing. I used to love picking wild rhubarb - as a child I would eat it straight from the ground! Would love to be able to find that again. We have a rhubarb plant that keeps growing in our garden which is great, and recently we have discovered a Gooseberry bush at the bottom of the garden. Oh and I have some herbs that the bees love too, so win win. gorgeous concoction. Meringue and berries are always a winner!